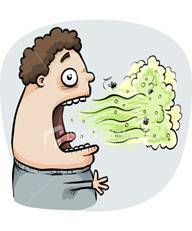 Bad breath, sometimes called halitosis, means that you have an unpleasant smell on your breath that other people notice when you speak or breathe out. The exact number of people with bad breath is not known, but it is common. For any individual, the exact status of their own breath can be difficult to ascertain. The reason for this lies in the fact that the oral cavity is connected to our nose by way of an opening which lies in the back of our mouth (in the region of our soft palate). Since noses tend to filter out and ignore background odors, it filters out and ignores the quality of our own breath. This means that it is quite possible for a person to have bad breath, yet not be aware of it. The things you eat and drink affect your breath. Common examples of foods and beverages that may cause bad breath include onions, garlic, cheese, pastrami, certain spices, orange juice and soda. Once food is digested and its oils are absorbed into the bloodstream, they're carried into the lungs. The odor is given off in your breath. Bad breath may also be a sign of a health problem. Chronic lung infections, liver or kidney diseases and diabetes are some conditions that may cause bad breath. Bad breath is a problem that is shared by millions of people across the country. Until recently, there really has not been an effective scientific approach to diagnosing and treating bad breath or chronic halitosis conditions. Brushing, flossing and seeing your dentist regularly may reduce bad breath. Some dental hygienists recommend brushing your tongue, since it traps large amounts of bacteria. Additional protection against the buildup of bacteria in your mouth can be achieved by rinsing with a mouthwash after you finish brushing. Yoga means 'Union' or 'Yoking'. It is the process by which we bring into harmonious balance our many levels of being (body, mind, and spirit) and connect with and experience the centre of supreme consciousness inherent in each of us. The basic idea of yoga is to unite the atma or individual soul with the paramatma or the Universal Soul. According to Yoga philosophy, by cleansing one's mind and controlling one's thought processes one can return to that primeval state, when the individual self was nothing but a part of the Divine Self. This is the sense encapsulated in the term samadhi. The aim of the yogi is to be able to perceive the world in its true light and to accept that truth in its entirety. The physical part of the yoga lifestyle is called hatha yoga. Hatha yoga focuses on asanas, or poses. A person who practices yoga goes through a series of specific poses while controlling his or her breathing. Some types of yoga also involve meditation and chanting. Sun Salutation is one of the more common postures within Yoga. This particular exercise not only stretches your spine and joints, but also works to regulate your breathing, calm your mind, and energize your body. Generally, Sun Salutation is used to begin a set of Yoga exercises. You can use it to begin your day. Fish pose is another important yoga posture which helps in providing relief from tension and relaxes the mind and the body. It eases the pressure on the mind and provides support to the back and the shoulders. It is a comfortable Yoga pose which does not cause strain to the other organs of the body. "Sava" means "dead body" in Sanskrit. To practice this asana, one should lie motionless on the floor like as dead body in order to secure complete relaxation of all parts of his body and remove tensions, both physical and mental. Seated Forward Bend Pose is a foundation Yoga pose that greatly helps you go within yourself, in a manner that restores both your body and mind. In ancient times yogis were known to bow down to the rising sun in the east. Thus by doing this, intense west stretch they aligned themselves on an east-west axis. How deep physically you go into the pose is not half as important as how much you are able to surrender while doing it. • Hold this position for five to thirty seconds. • Then slowly bring the leg down on the ground. This is wonderful pose for gaining courage and lightening your emotional load; the facial expressions involved are guaranteed to boost your mood, especially if you perform this pose in front of a mirror. • Kneel on the floor; keep your knees about shoulder-width apart. • Sit back on your heels; your calves should be flat on the floor. • Spread the knees apart a little further; only move them as far as is comfortable. • Straighten and lengthen the back and shoulders; sit up tall. • Without rounding the shoulders, place your hands loosely on your knees. • Inhale and lean forward slightly without compromising your straight spine. • Stretch your mouth and jaw open as wide as possible. Extend your tongue and cross your eyes by looking at the tip of your nose; also tense and straighten your fingers out from their resting place on the knees. • Hold this position for one breath and then relax; lean back and let your fingers drop back to your knees. Close the mouth and eyes.